يشكل فندق DULC Holiday Cabins بموقعه الممتاز في منطقة برامج عائلية, سياحة ضمن مدينة غرامبيانز، مكاناً ملائماً لقضاء العطلة بعيداً عن عجقة أيام العمل. يمكن من هنا للضيوف الاستمتاع بسهولة الوصول إلى كل ما تقدمه هذه المدينة النابضة بالحياة. يشكل هذا الفندق ملاذاَ مريحاً للاسترخاء ويمنح زواره فرصة للاستجمام والتجدد، وهو يقع على بعد خطوات من المعالم السياحية الكثيرة للمدينة كمثل: ‪The Balconies‬. كما يقدم DULC Holiday Cabins الكثير من الخدمات لإغناء رحلتك في غرامبيانز. يقدم الفندق صف السيارات, مرافق للشواء لضمان الراحة القصوى لضيوفه. تنعكس أجواء DULC Holiday Cabins في غرف الضيوف.تلفزيون بشاشة مسطحة, حوض الاسترخاء, مكيف هواء, تدفئة, مكتب هي بعض الميزات الموجود في العديد من الغرف. كما أن مجموعة الخدمات الواسعة الموجودة في الفندق لضمان راحتك تترك لك الكثير من الخيارات لقضاء وقتك أثناء فترة إقامتك. إن DULC Holiday Cabins هو خيار ذكي بالنسبة للمسافرين إلى غرامبيانز، بما يوفره من إقامة هادئة ومرحة. A great escape for a few days, wouldn't hesitate to recommend this place. 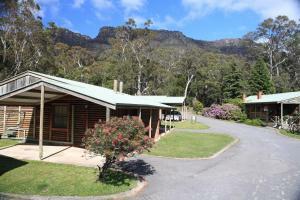 We had a lovely 2 night stay detouring from a trip along the Great Ocean Road. The cabin was warm and delightful in the middle of winter. 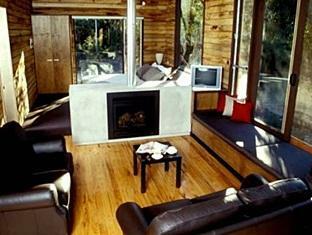 Large gas fire, spa bath, quality appliances, big comfortable bed and all set in a peaceful oasis of Australian bush. Wallabies just outside the door! The small town of Halls Gap was a little disappointing but we did take into account that we were there in the middle of winter and that the area had been savaged by bush fire earlier in the year. Be aware that if you want to self cater bring all your provisions with you. 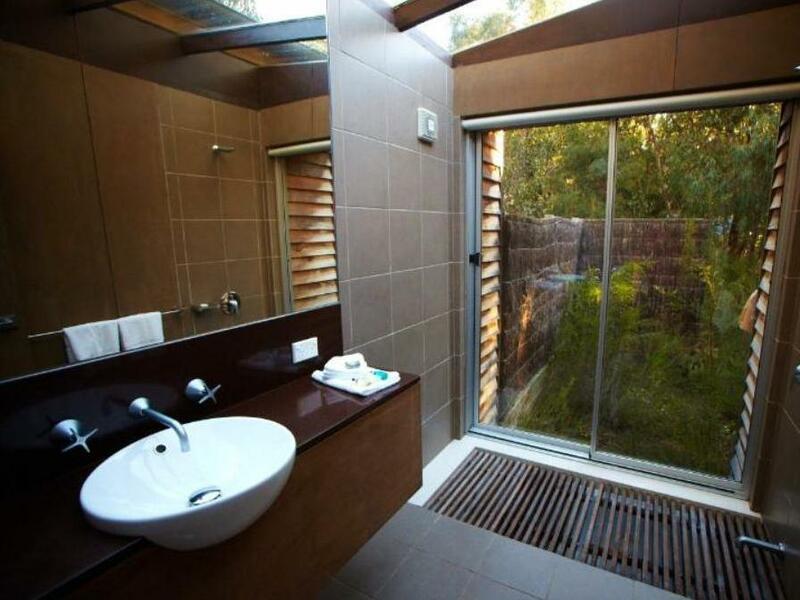 Luxury in true Aussie bush. You cant do better than that! We had a lovely stay at DULC. 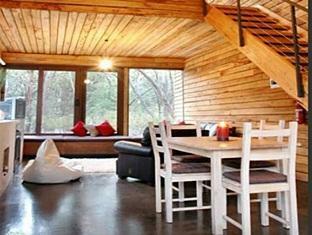 The cabin is designed really well, with lovely breakfast area, open living area and bedroom. Nice big windows and timber lined walls and ceiling. The bath with big window over it was stunning. The prefect place to come back to after trekking through the beautiful Grampian ranges. we brought our own groceries and cooked at the cabin. It was a much better option considering the selection of restaurants at Halls Gap is very limited. Had a well rested stay at the DULC. 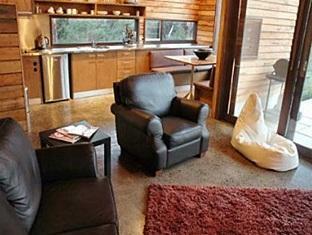 The cabin is well decorated with all modern amenities provided. It was a wonderful experience soaking in the jacuzzi and looking up to a beautiful night sky through the glass ceiling. 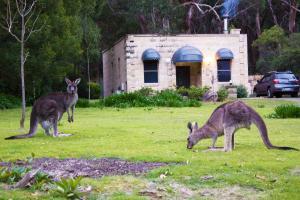 Saw 2 kangaroos hopped past our balcony as well. Only regret we had was not buying our groceries in the bigger towns for our 2 night stay before entering the Grampians. The grocer stores in the township provided simple items but at pricey cost. De cabin is top en van alle gemakken voorzien. Wij misten alleen vloerverwarming in de badkamer (koud in de winter) en vonden de instap van de douche in het bad te hoog. De cabin ligt heel rustig, maar toch centraal ten opzichte van alle bezienswaardigheden. Mountainview hebben wij niet gezien.